Austrian filmmaker Nikolaus Geyrhalter’s latest documentary, Our Daily Bread, illustrates grimly in about an hour and a half how all food, crops and animals, raised in the industrial agricultural system qualify as Frankenfoods. Our Daily Bread shows us the nightmare that is producing food for 6 billion of us on this planet in the 21st century. We all partake in it everyday of our lives, yet so few of us really think of where our food comes from. Geyrhalter has tracked down for us exactly where filet mignon and eggs and bacon, even tomatoes, peppers and apples come from, and it is not pretty. The 21st century human being is so cut off from the reality of foodstuffs that it seems the more we don’t look, the worse it gets. Geyrhalter spent two years across Europe on factory farms, shooting images of pigs, cows and chickens being slaughtered by the thousands. Think of the scene in Baraka where the accidentally hatched baby chicks were being gassed in an egg factory, then multiply it by as dozen or so times. Unlike Baraka, there is not a score substituting for narrative in Our Daily Bread. Geyrhalter’s piece is virtually quiet, except for the sound of machines, muffled human voices and lots and lots of water hoses. There are so many shots of cleaning and watering in the film, it is difficult not to remember Lady Macbeth. Human beings industrialized food production and brought it indoors to confined crowded environments and the result is lots of blood and chemicals that need to be washed from the bunny suits of workers, the floors and the equipment again and again. But water will not wash our sins away and the workers in Geyrhalter’s film seem to be aware of this. 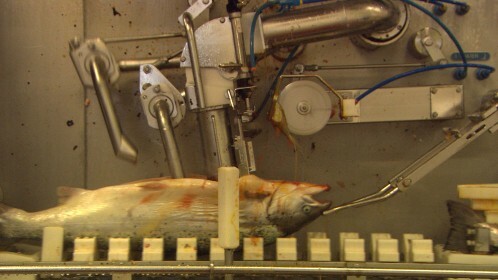 The only thing more disturbing in the film than the cruel and unusual treatment and killing of the animals is the situation of the people who work at these factories. Though we have managed to invent lots of machines to help with the dirty work, it seems the most gruesome duties are still reserved for the human workers. There has to be a person to give a cow a C-section, a person euthanize pigs and a person to cut off the heads of chickens. None of the factory farm workers in Our Daily Bread look happy or pleased with their jobs. The situation in the fields does not look any brighter. 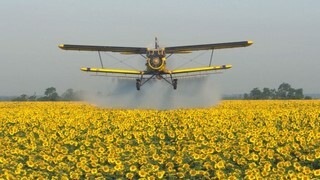 In one scene, a field of beautiful flowers is suddenly overshadowed by a crop duster spraying pesticides; in many others Geyrhalter shows us acres and acres of land devoted to the cultivation of one single plant. Workers in these fields and greenhouses seem like robots picking produce, watering or applying a concoction of chemicals. We even get a glimpse of a field supervisor with his binoculars watching the workers on the field, reminding us of the ironic similarity to days of plantations and slavery. Even salt miners look dehumanized as they travel hundreds of feet below the European continent and find themselves in a massive maze of gigantic tunnels for the simplest of dinner table items. It’s true and Geyrhalter’s chosen technique in Our Daily Bread, sans narration or score, helps the viewer contemplate upon this. This film should be required viewing for anyone who eats. These images should be replaying in every consumer’s head while buying groceries or ordering lunch at a restaurant. It is time we stop corn-syrup coating the hellish nightmare we call food in the 21st century. Finally someone has made the film burning in my heart for years. I’ve been an organic eater and organic proponent for over 30 years. While eating organically and supporting the organic industry isn’t a perfect solution, it is indeed, my friends, one of the best solutions we have at our immediate disposal…at least mine, anyways. The film that I was looking for !! Worst documentary ever. Did the directory think food appeared out of thin air??? Raising livestock for food has NEVER been a pretty sight. And all the BS about the organic industry, blah, blah, blah………..it is just that: an industry, same as any other food industry when you get right down to it. Great review!! And I guess.. great documentary! I’m about to watch it, just got it on DVD!! Utopia: Everyone should feed themselves…. then no more exploitation, neither slavery would occur. But I don’t believe that’s going to happen in a near future, so.. I will do it myself, and live in peace and harmony with our planet. Miguel, you seem a little distanced from reality. Industry is not life, and if you think this is just how it has to be you must be warpped by human’s modern invention. This world humans made wasn’t perfect but i think it’s time to finally see that and do something.